Tag Archive | "Endler’s Livebearer (Poecilia wingei)"
The Endler’s Livebearer (Poecilia wingei) is believed to be endemic to two coastal lagoons in northeast Venezuela but was originally discovered by Franklyn F. Bond in 1937 and later rediscovered by Professor John A. Endler in Laguna de Patos, Cumana. Laguna de Patos was originally a brackish water lake that was cut off from the ocean by a sandbar. Over time the chemistry of the lake was altered by freshwater runoff, turning it into a very warm freshwater lake with hard green water, caused by high concentrations of algae. 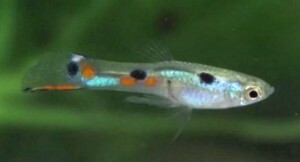 Because of water pollution caused by a garbage dump that was built adjacent to Laguna de Patos, wild Endler’s Livebearers were believed to be extinct however, several wild varieties have been discovered during the past 15 years. 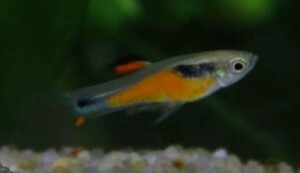 Because of their small size, the Endler’s Livebearer is not suitable for a general community tank. 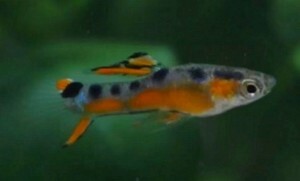 If you plan to breed them, keep them in a tank with conspecifics. 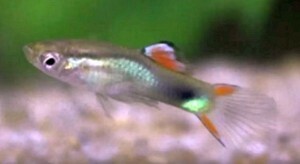 They are compatible with small, peaceful species such as dwarf corydoras, small rainbowfish such as Iratherina werneri or Pseudomugil sp. 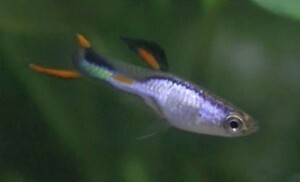 and the smaller peaceful tetras. 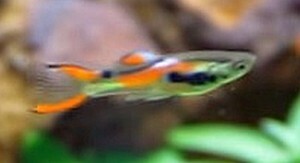 Avoid keeping them with common guppies or they will readily crossbreed. 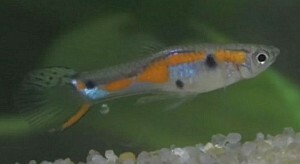 Several females should be kept together to prevent bullying and territorial disputes. 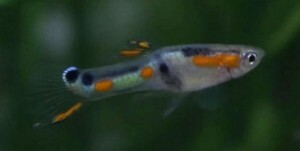 The Endler’s Livebearer should be kept in a densely planted aquarium of at least 20 gallons with a sandy or fine gravel substrate, a few river rock, a small piece of driftwood , and some floating plants. Java Fern , Java Moss , or other hardy plants make a good choice for the hard water conditions these fish prefer. These fish are extremely active and produce very little waste, so a powerful filtration system with strong water flow is not necessary. 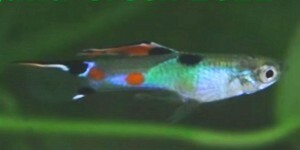 They are very tolerant of changing water conditions and make a good starter fish for beginning tropical fish keeping enthusiasts. 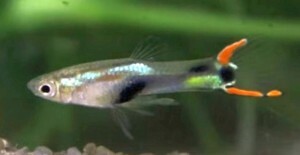 The Endler’s Livebearer is extremely prolific and almost too easy to breed in an aquarium environment. 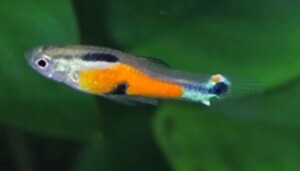 In fact if you’re not interested in breeding them, purchase only males. Several females should be kept with each male to prevent too much harassment, and plenty of live plants should be placed in the breeding tank for the females to retreat to when being pursued. 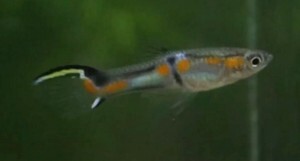 The males will be constantly chasing the females, spreading their fins, and quivering in front of them. 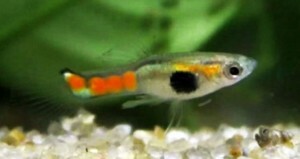 Other than that, breeding them is the same as breeding other live bearers. 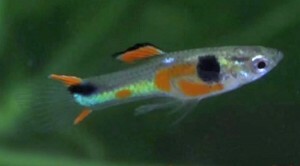 The Endler’s Livebearer will produce a new brood every 23 to 24 days and depending on the size and age of the female, the brood can be anywhere from 5 to 30 young. 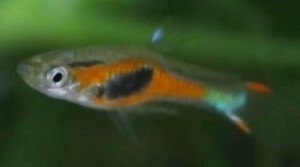 The adults seldom eat their young, but most breeders remove gravid females to a separate brooding tank to allow her to give birth without the constant attentions of the males. 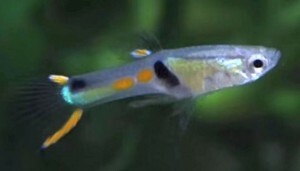 The fry are relatively large and will immediately accept powdered or finely crushed flake food, and newly hatched brine shrimp. 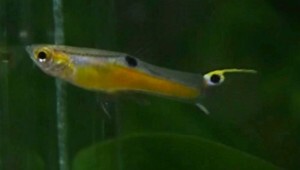 The young should be fed 2 to 3 times a day, and will grow very quickly. 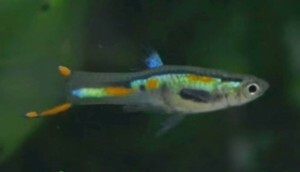 Within 3 to 5 weeks, the males will begin to show their adult coloration. Females will be able to produce offspring at 2 months. 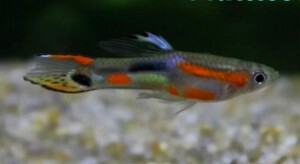 Endler’s Livebearers are omnivores that feed on zoobenthos and detritus in the wild. In an aquarium environment they should be fed algae based and meaty foods. An omnivore flake food, with occasional offerings of live, frozen, or freeze dried bloodworms, brine shrimp, blackworms, mosquito larvae, or tubifex will keep them healthy. 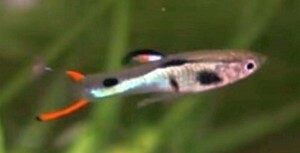 Because of the gaining popularity of Endler’s Livebearers (Poecilia wingei) with tropical fish keeping enthusiasts, and the fact that they are such prolific breeders that will readily crossbreed with other guppy species; a classification system was created to more easily identify their origin for hobbyists. 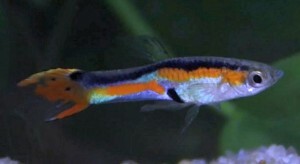 Class N: Wild caught Endler’s Livebearers that can be traced to their native Venezuelan waters. 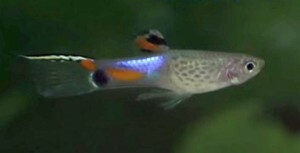 Class K: Crossbred or hybridized Endler’s Livebearers. 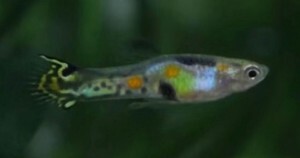 Most Endler’s Livebearers offered for sale are Class K specimens (below) that are approximately 1/2″ to 1″ in size.